Breaking the traditional barrier between The Ones Who Know (the presenter/teacher) and The Ones Who Listen (attendees/students) was surprisngly easy to implement... there were NO pre-arranged sessions. There was, however, a giant board that looked like a conference schedule--complete with rooms and times--except the session topics were blank! It was up to the campers to fill them in. A self-organizing learning experience. This photo shows the board (it's hard to see, so just go with me here...) where the rooms are across the top and the time slots (hours) are on the left side. 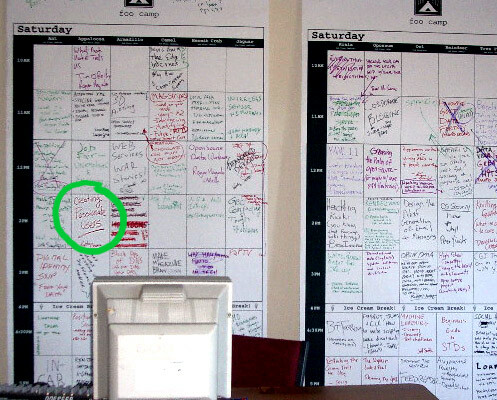 In the green circle, you'll see the origin of this blog... it all started with three words I scribbled on the board, "Creating Passionate Users". So I owe this blog, the talks, and the (coming) book to my decision at Foo Camp to "pay my foo dues" by coming up with a topic I could share. Which is just one example of the tangible new things that can come from the self-organizing format. I had originally planned to talk solely to the O'Reilly editors about the lessons learned from applying these principles to the creation of the Head First series, but at the last second, I decided that since most of it could be applied to virtually anything for which the notion of "passionate users" makes sense, I would give it a more generic title. If I'd scribbled, "Lessons learned from Head First", this blog would not exist. But because of this format -- which motivated me to try to contribute something to the campers--something new emerged. I would love to see this self-organizing model (which some are calling the unconference) applied more often in as many settings as possible, from K-12 schools to college to corporate learning. A lot of adult learning environments (including colleges) do have scenarios in which the students/learners are asked to help evolve the course itself... including taking turns presenting some of the material, but these kinds of activities are the exception, when they should be a key component. I've argued with instructors for years over this--as they claim, "Students didn't come here to be taught by other students who don't know anything--they came here to get the facts from ME, the expert." Oh really? If you drill down, you'd find that most of the students/learners are there to learn. They may have been conditioned through tradition that this means the student listens (and does the occasional "lab exercise") while the expert dispenses facts and knowledge, but that doesn't mean it's truly what most learners want. They want to learn. And surprisingly little real, deep learning comes from sitting in a chair listening. Think about it... you often learn best (or at least, most memorably) when you're suddenly thrown in the deep end of a situation where you must figure something out in order to keep going or fix a problem. We learn from doing, and we learn from interacting and discussing with others. But we often learn best that which we have to teach. Group A has a formal semester presentation on programming. Group B does NOT have a traditional semester on programming, BUT the students are asked to create an interactive multimedia program that teaches fractions to younger kids. That means Group B must learn--somehow--how to program and develop a teaching game, and at the same time... understand enough about fractions to teach fractions through that game. With Group B, the students had to work in teams and the teachers were there solely as mentors, offering ad-hoc learning to the "developers". Who tested better for their programming skills at the end? You might want to check out this (old) fascinating book by the very cool Yasmin Kafai on the MIT Media Lab's "Game Design Project". Most importantly, if you're a programmer, teacher, parent, learner, I strongly encourage you to check out the video on the project! The quality of the video is poor, and it looks like it was compressed with circa-1994 single-speed CD-ROM drives in mind, so the sound is off too. But... it'll definitely give you something to think about. So, teach to learn, learn to teach. If we can stop drawing those hard lines between Knowlege Giver and Knowledge Receiver, everyone benefits. And the Foo Camp model is a great implementation of this. Of course... some of those who weren't invited, disagree. Apparently Foo Camp has indeed hit the Koolaid point. With the exception of Robert Scoble's message, some of these "I wasn't invited and now I'm MAD because I'm too important to have been left off the guest list" folks sound less mature than the 11-year old programmers in the video. Having said that, I was one of the randomly-selected lucky ones invited back this year, so I'll be blogging for y'all from there this weekend. (The fact that they put me on the guest list again should COMPLETELY dispell the myths that this event is just for the "elites" or the super smart. Although having checked the guest list, I think I'm dramatically bringing down the average IQ score of the campers). In the meantime, please consider ways in which you can run a Foo Camp-like self-organizing gathering of your own -- whether as a conference or a smaller user group meeting, a classroom, or even a dinner party. And there's a very interesting podcast about unconferencing on Johnnie Moore's blog. Definitely worth a listen. If you're at Foo, please say hello. And as of tonight, less than 24 hours before Foo, I have no idea what I'm going to write on that board. If you have any ideas, I'd love to hear them! Wish I could join you there. We were invited but my kids are in town. DD is leaving Satyrday to go back to Minnesota for a highschool created BY THE STUDENTS! where she's passionate about attending. Can't beat that, eh? So I'm spending my last weekend with her until Thanksgiving... somehow, that seems way more important right now - even if I will miss an awesome opportunity to learn with lots of really kewl folks! Picking up a subject this close to the D day is quite a challenge. If you had, let's say, at least a week, I'd say you should pick something you *don't* know very well. Whenever I'm in one of those collaborative learning groups, I do exactly what I'm supposed not to do: I won't pick what I'm best, I won't choose to teach my forte. What I love to do is pick something I have some interest, but never had the time or will to really study about. Then I'll try to absorb as much knowledge as I can in a week, just before the sessions. This way, I'll have something to share (i.e., I won't be all uuummms and aaaahhnns), but will also have lots and lots to learn as well. It's quite a delightful experience. I agree with Marcus, you will always learn more from the experience if you study something that you just are interested in. I find that the best way to find new ways of looking at a subject is to read books that are close to the subject but not focused on them. Freakanomics by Stephen Levitt and The World is Flat by Thomas L. Friedman are books that I have read recently that really expanded my thinking. I have more details but don't want to spill them here if some foo-er (fooey?) is going to be reading your blog. How do I email them to ya Kathy? hgs: Thanks for that link... I'm going to check out that book. Marcus and Peter - YES! I completely agree. (I've been listening to "Freakanomics" on my oh-so-fashionable iPod, and I'm finding it pretty mind-bending. I haven't read the World is Flat, but I've been listening to some of his interviews on NPR... I'd love to hear more of what you thought about the book Peter. But you have to hurry! I'm heading for the airport in a few minutes. I just want to say that you are right on about blurring the lines between the knowledge giver and the knowledge receiver. I think that people REALLY learn something when they have to teach it to someone else. Teaching something requires you to form your own deeper understanding of the concept. I was recently one of two instructors at for a summer institute involving 24 high school sophomores. At this institute we used the problem based learning approach to teach digital literacy, information technology, and space science with great success. The students were really positive and engaged. So to sum it all up... RIGHT ON! Thanks so much for this Martin. And although this might be a bit too California for you Martin-- YOU RULE! Your comments about students and how they learn really struck a chord. So true! Are you familiar with Destination Imagination? A creative problem solving program (NO adult interference allowed!) for kids, they've just recently added a program called DI Later for adults. Fun stuff. Once again, great stuff and a great read. The guys behing BloggerCon may want to take credit for the unconference format (if credit is due). That's the first place I heard of an "unconference" format. Sounds like great fun, as long as all attendees are engaged. "But we often learn best that which we have to teach."